The Kudox Wall Mounted Towel Rail Controller provides greater control over the electric towel rails in your system, allowing you to select a specific heat level that suits you. Electrical components for bathrooms, cloakrooms and wet rooms must be professionally installed by a qualified electrician and are not sold as a DIY product. Always defer to the manufacturer’s guidelines about the bathroom suitability of any product. For more information, see the Kudox Wall Controller Manual. The Kudox Wall Mounted Towel Rail Controller comes with a 1 Year Manufacturer's Warranty (subject to manufacturer's terms and conditions). The Kudox Wall Mounted Towel Rail Controller adds control to bathroom heating systems. 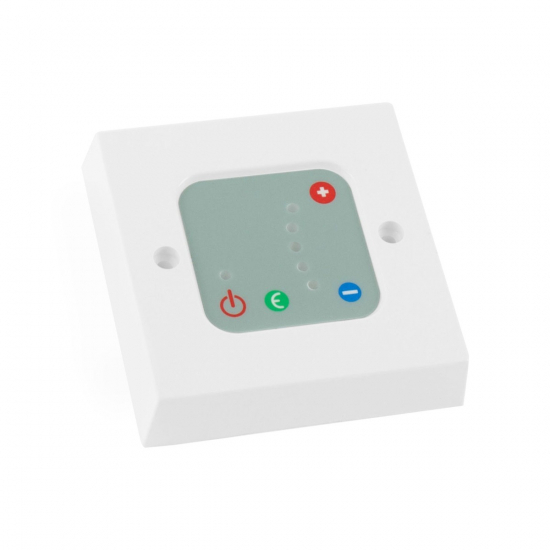 Compatible with all standard towel rails and radiators, the controller includes an On-Off Button, +/- surface temperature buttons and an eco button which switches heating on for 2 hours and then turns off automatically. The Kudox Controller should be fitted by a professional electrician. For more information, see the Kudox Wall Controller Manual.